기사요약: 유엔 안전보장이사회가 북한의 6차 핵실험에 따른 새로운 제재 결의안을 채택했다. 대북 유류 공급 축소, 북한 인민무력부장 제재, 외화벌이 노동자 규제 등의 조항들이 포함되어있지만, 이러한 제재들이 갖는 실효성에 대한 의견이 엇갈리고 있다. The UN has imposed its toughest sanctions on North Korea to date, but South Korea’s politicians and experts remain divided on how efficient they will be. On Tuesday, the presidential office and the ruling party welcomed the measures, hailing them as an example of the international community uniting to bring Pyongyang under control. Seoul’s presidential office welcomed the new resolution, saying that its approval confirms that the international community holds the shared belief that stronger measures are needed. 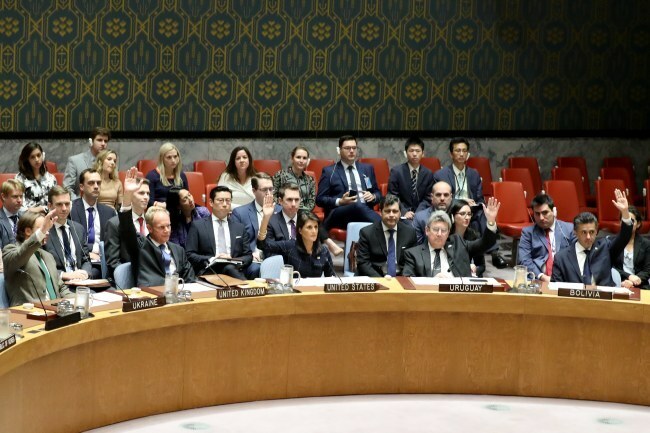 “(The presidential office) highly rates the UNSC unanimously adopting resolution 2375 in a short period of time,” Cheong Wa Dae spokesman Park Soo-hyun said. 기사요약: 한국인이라면 누구나 좋아하는 라면. 이 라면을 위한 축제인 ‘2017년 대한민국 라면 박람회’가 서울 삼성동 코엑스에서 열렸다. 본 행사에서는 다양한 브랜드의 신제품과 전세계의 특색있는 라면들이 선보여졌다. Ramen -- or ramyeon, as instant noodles are known locally -- is widely recognized as Korea’s comfort food. Korea is the leading consumer of ramen per person in the world, each person eating about 76 bowls per year, according to the Ministry of Agriculture, Food and Rural Affairs. The dish’s popularity was palpable at the annual Ramen Fair that took place at the Coex Convention and Exhibition Center in Seoul from Sept. 9-11. In its third year, some 80 companies set up 230 booths at the fair. On Sunday, the fair was packed with groups of friends, families or solo visitors standing in long lines to try different types of ramen.